Every year in Maine, thousands of people celebrate birthdays, graduations, and weddings, across the state. Whether your event is small-scale or big, you’re going to need a great catering service to supply your guests with delicious food. Since Maine is a foodie paradise, there is no shortage of excellent catering companies for every occasion. Here are the 10 best. The Black Tie Company, based in Portland, is a longtime favorite in southern Maine. Since 1988, the Black Tie has delivered artfully creative and delicious cuisine to thousands of weddings, corporate events, and more through southern Maine and New Hampshire. They offer a range of seasonal menus serving everything from seafood to desserts to salads. Black Tie also serves breakfast and lunch in the heart of the Old Port at Union Kitchen. The Good Food Store and Catering offers locally grown organic veggies and food at their store in Bethel. In addition to their food store and barbecue trailer, the Good Food Store also offers catering and in-home chef services. From weddings to events, they will serve up a menu of delicious food just for you. No menu is served twice. Launched in 2009 by Christine and Christian Hayes, Dandelion Catering Co. has taken the Greater Portland community by storm. They focus on quality, fresh, and locally-sourced products in their unique menus. They cater everything from weddings to brunches to cocktail parties and everything in between. Their Dandelion ToGo service is also an excellent and tasty buy if you’re ever looking for a special dinner. Bar Harbor Catering Company (BHCC) has become the go-to caterer in the Midcoast and Down East region of Maine. Over the years, BHCC has won many awards including winning Bride’s Choice Awards twice. Every dish at BHCC is handmade using only fresh, high quality locally-sourced ingredients. And since they are based on Mount Desert Island, they know seafood. Don’t miss their famous lobster bakes. Trillium Caterers is a full-service catering and events company based in Belfast. From hors d’oeuvres to meats and seafood to dessert, Trillium can do it all. Each menu utilizes locally sourced products from Midcoast farmers and producers. You’ll find a lot of Maine lobster on their sample menus too! Since 2011, Harvest Moon Catering in Waldoboro has been providing sustainable farm-to-table cuisine to weddings and events across Maine. While they have a great menu, Harvest Moon is famous for their wood fire feasts on their custom crafted tow-behind Argentine style grill and dome-shaped oven. Their wood-fired meals will be the talk of the party for years. Stone Cove Catering provides creative catering throughout the Midcoast of Maine. No two menus are alike as Stone Cove Catering believes that they must cater for your personal and unique needs. They offer everything from lobster bakes to pig roasts and barbecues to traditional wedding feasts. Swan’s Way Catering started as a restaurant in 1980 and has since turned into a catering business dedicated to creative dishes using fresh local seafood, meats, and organic produce. 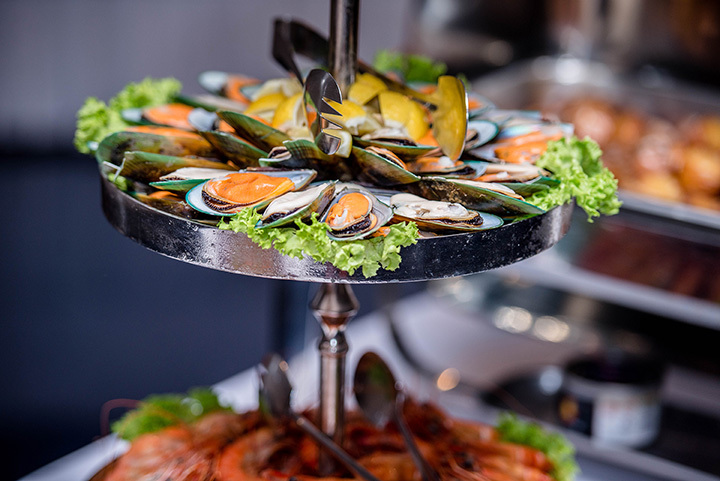 Whether you want a backyard barbecue or a formal sit-down dinner, Swan’s Way will work with you to determine the perfect menu for your event. Blue Elephant Catering has appeared in numerous wedding and food magazines over the years and there is good reason—they are just that good! Blue Elephant Catering offers one-of-a-kind wedding packages and events making them more than just a catering service. Since 2005, 111 Maine has been serving up delicious food at weddings and other events across southern Maine. Their unique and diverse menus support local farmers, meat growers, and cheese makers so you know the food is fresh. Everyone raves about the food presentation so you know their food is Instagram-worthy!